The weather should begin to cool. My daily commute has been lengthened by school bus routes. New seasons will be back on television. Fall decorations are going up this weekend. And football season is here. Yes, it’s (one of) the most wonderful time(s) of the year! In our home, the countdown to football season began at approximately 10:00 PM on Sunday, February 5 when the New York Giants were crowned Super Bowl XLVI champs. And beginning tomorrow, football will play around the clock on our TV for the next several months: college games, NFL games, coverage and highlights of these games, replays of these games, etc., etc., etc. 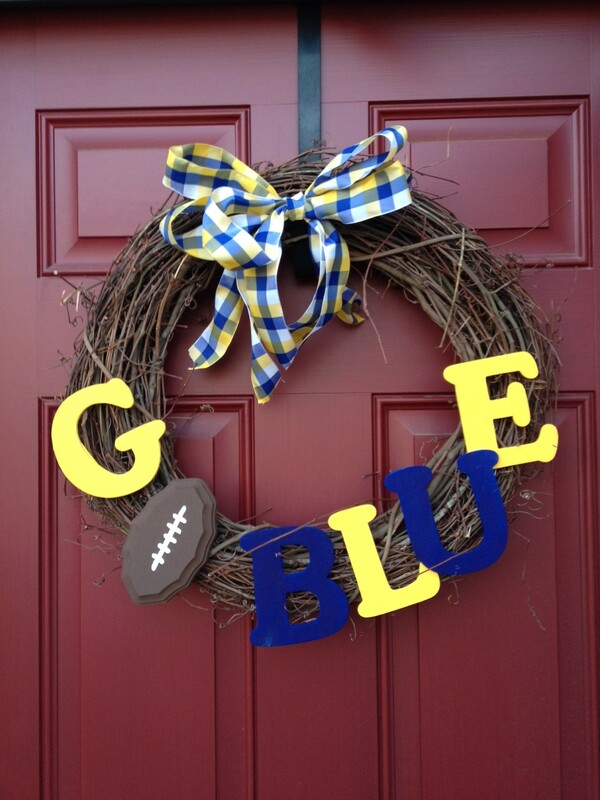 Go Blue and Go Browns (always #1 in my book; even if their colors aren’t hanging on our front door)! – I’ve always felt grateful to work with such a talented, kind, and fun group of people and this past week made me appreciate them even more. Not only did they welcome me back in such a thoughtful way, but so many of them covered my work responsibilities perfectly while I was out which helped make for a much less stressful return. In a few days, I’ll be right back in the swing of things. – Brian took the day off work on Friday to watch Bridget. Not only was it a relief for me that she was with him at home, but it was a great day for both of them. The love he has for her warms my heart and I can see it reciprocated from her more and more everyday. – And last but certainly not least, Bridget rolled over for the first time! She’s been so close for so long and we knew it was going to happen anytime. I kept hoping she would do it for us and not while we were at work and thankfully, she did. As Murphy’s Law would have it, I recorded about 30 minutes of her getting closer and closer and when I didn’t have the camcorder in reach is when she decided to be our little show pony. It’s funny how when you become a parent, the most simple things become so much more. We cheered and high-fived like the Browns had won the Superbowl (although I will probably never know how that really feels). I hope you all have a great week. A three day weekend is upon us! I’ve been told many times to enjoy every minute with Bridget because before I know it, she’ll be grown. Yet I didn’t quite appreciate that sentiment until today. For nine months, we waited impatiently for her arrival. During the 41st week of my pregnancy, I was convinced she was never coming out. And then she did. And then there were days that seemed like they would never end and mornings that seemed like they would never come. But they did. And August 22, the day that seemed so far away when I left work in May, came. Monday was the toughest. Reality had set in that my time at home with Bridget was nearing the end. Tuesday was better. I was determined to enjoy every minute with her and not spend it feeling sad, so we cuddled in our pajamas all day. Today was a strange mix of emotions: sad, nervous, and excited; almost like the fall of 2002 when I left small town Chatham, Ohio for Heidelberg. And then two things happened that helped brighten a gloomy day. 1. 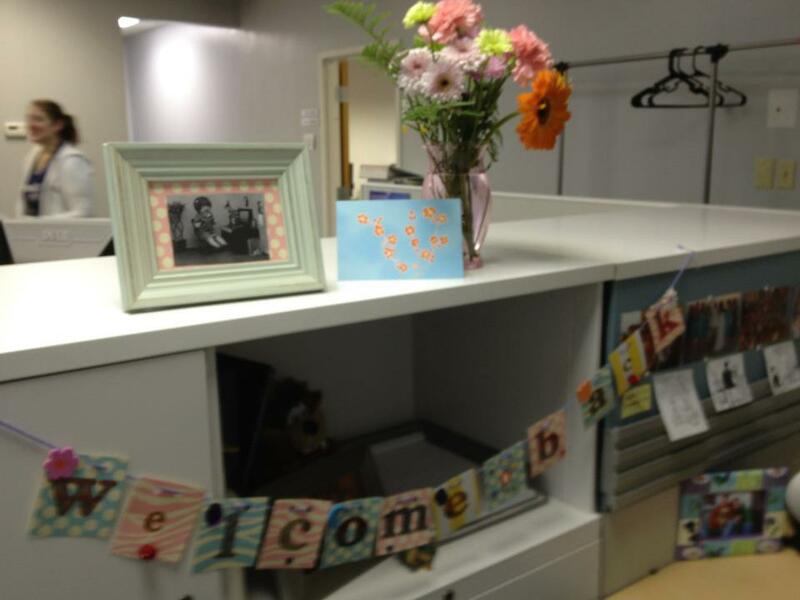 I was welcomed back by my co-workers with a sign, card, beautiful flowers, and a creepy picture of a crying baby dressed as an adult (which achieved what they set out for; a much-needed laugh). 2. Miss Denise sent me this picture with the caption, “Hi Mommy!” So simple, yet exactly what I needed. We survived our first day apart. One day at a time, right? And now I understand more than ever the wisdom that is to enjoy every minute because time goes fast. I’m going to try not to blink. This past week was a good one; a really good one. It was my last full week home with Bridget. I know this coming week is going to be tough (I can’t even type this sentence without tearing up), so I’m going to enjoy this feeling for a little while longer. – Since my days of competitive volleyball ended in college, I’ve been involved in many leagues since. After Brian and I married, he joined in the fun and for the last four years, we’ve played year round with the same group of folks. I sat out for this last year, and Brian did as well for the summer, so we missed seeing our teammates week after week. Since many of them hadn’t met Bridget, we played spectators to a game and took her along. – Bridget and I spent our last Thursday at Nanny and Papa’s. We created so many memories this summer, and these will be some of my most cherished. – For our baby shower, my Mom’s longtime friend, Linda, bought us a bottle of champagne with a card attached that read, “Celebrate when you can.” The bottle’s been chilling in the fridge, waiting for the right time to be opened, and this past Friday was it. 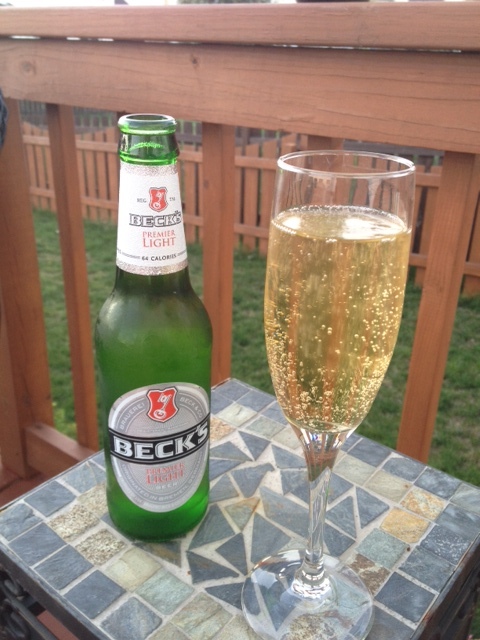 After Bridget turned in for the night, Brian and I enjoyed some bubbly on our deck. Cheers to having so much to celebrate and thank you, Linda, for encouraging it! – While this may not seem like a big deal to some, anyone who I’ve spoken to since June knows the ongoing battle that was the bottle. Fingers crossed, we *think* Bridget has finally mastered it. This is undoubtedly the really “good stuff” from this past week, and just in the nick of time. I am determined to find the good stuff in the coming week. As much as I wish my maternity leave wasn’t ending, I am grateful to have a job I enjoy, kind co-workers to welcome me back, a caregiver who will keep Bridget in good hands, and the love and support of family and friends. For those who know me, know the special relationship I share with my Grandparents, Nanny and Papa. They are and always have been a significant part of my life and who I am today. Which is why it means so much to me that they are now a part of Bridget’s life. 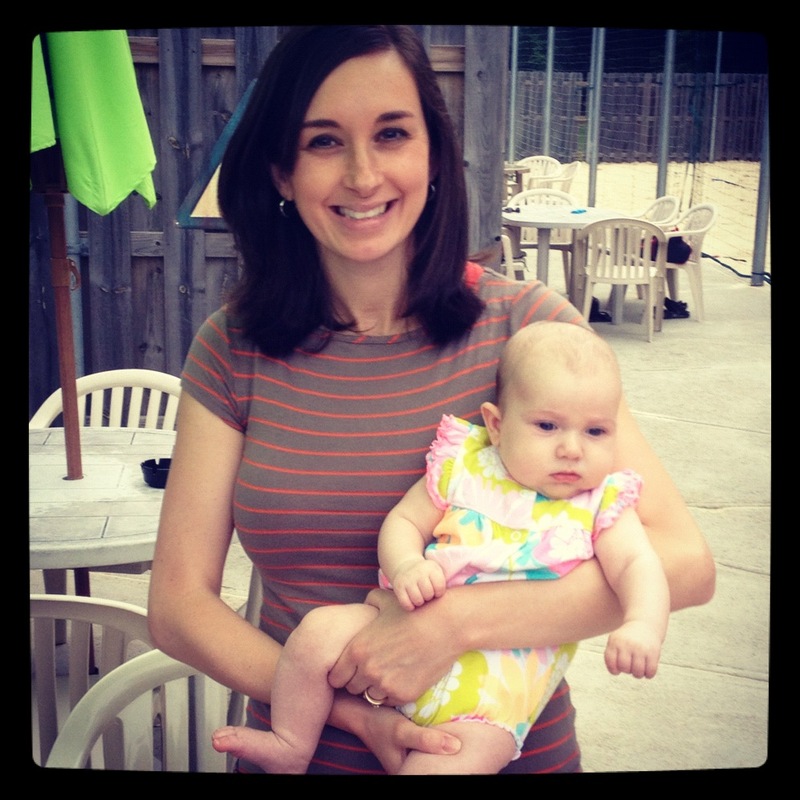 My 12 weeks of maternity leave have been truly amazing. I have gotten to spend so much quality time getting to know Bridget and learn what it is to be a Mom; and am still learning something new everyday. But one of my favorite memories during my time with Bridget will be our Thursdays. 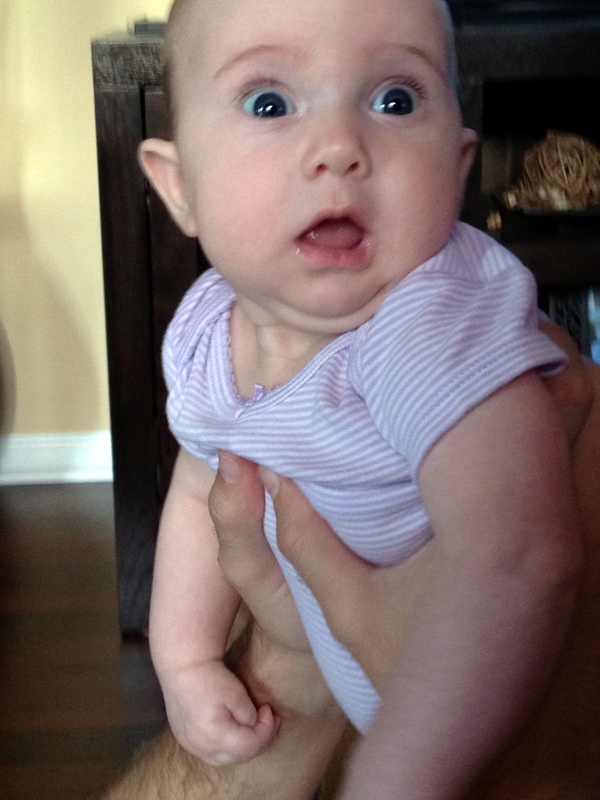 Since she was three weeks old, Bridget and I have spent every Thursday at Nanny and Papa’s house. Bridget will sit and stare at their ceiling fan and smile as it makes its way around. She’ll coo at Nanny as she talks to her, and unknowingly giggle at Papa’s inappropriate jokes. We’ll lay under the shade tree in their backyard looking at the sunlight peeking through the leaves. And then at 4:30, Grams (my Mom) will visit after work and Bridget will fall asleep on her shoulders. (Don’t be fooled; there is plenty of crying mixed in, too.) There is nothing elaborate or expensive about these days, but they are simply perfect. I leave there feeling fulfilled having spent the day with four of my favorite people and knowing that although Bridget won’t remember these early years, she was able to enjoy Nanny and Papa’s house in the summer just like her Mom did when she was growing up. 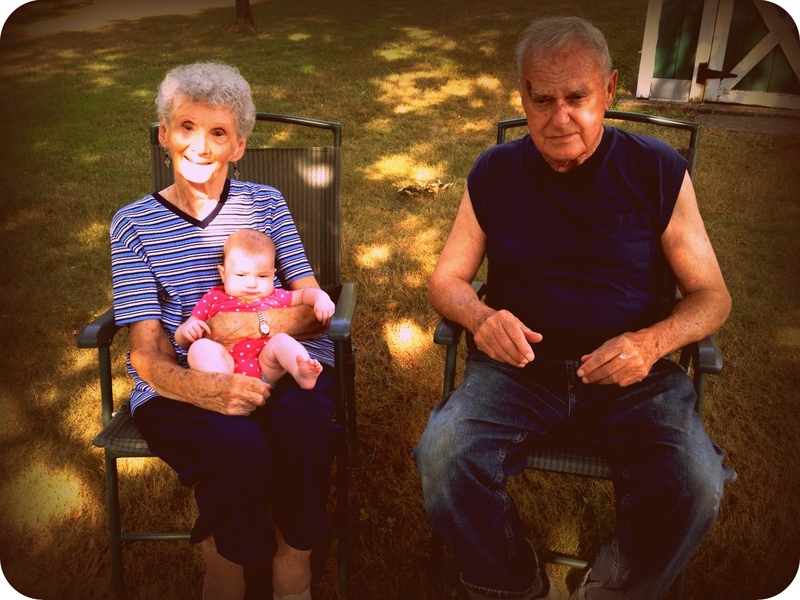 Thank you for these memories, Nanny and Papa! If you had to leave your house suddenly and could only grab one possession, what would it be? The common answer is photographs (aside from family members and pets, of course). I hope that I am never faced with that dilemma, but if I was, I found it unacceptable that, thanks to organization inspiration from Pinterest and months of nesting, I would know exactly where to grab the hand towels and brown sugar but wouldn’t even know where to begin for my pictures. My pictures are everywhere: albums, frames, phone, storage containers, Facebook, and flash drives. I needed to dedicate the same effort to organizing my pictures as I did to my laundry room and pantry. Especially now that another life is depending on me to document it. Below is how I got organized for day forward (older pictures will have to wait until I come up with a plan for them). Organize the digital mess: Previously, I would save pictures in a folder consistent with its Facebook album name. However, I don’t post all my pictures to Facebook (even less so lately), so this naming convention wasn’t sufficient. After moving the pictures worth keeping from my phone to our computer (via email), I created very specific folder names (event, date, etc. ), so I could easily locate pictures when needed. Clean up: As difficult as it was, I deleted all the “so-so” pictures. I decided that it was better to have a small number of quality pictures than dozens of average ones. Create the album: I dabbled in scrapbooking in high school and college, and while I appreciate the time and effort that goes into making one (a few of my best friends are scrapbooking experts and have beautiful books to show for it), it’s just not realistic for me. I opt to archive my pictures in a photo book. I created a few photo books in the past using Shutterfly but fell behind. Thanks to a LivingSocial deal for 60% off an 8×11 photo book, I revisited the site and was pleasantly surprised to find that they recently upgraded the experience with a new tool called “Custom Path” that offers thousands of digital scrapbooking assets: themes, pages of all colors and patterns, fonts, stickers, frames, etc. 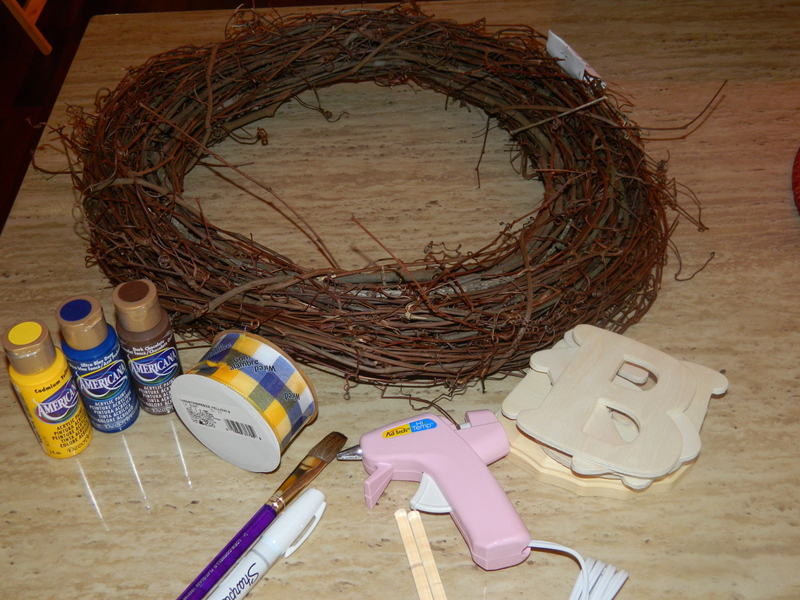 It’s just like scrapbooking without the add-up-quickly costs for embellishments and mess to clean up. I created my first photo book using the new tool to share the story of Bridget and absolutely love how it turned out. I am already onto the next one. Tip: Since May, Shutterfly has offered two LivingSocial deals for the Cleveland area. A hard cover, 20-page full color photo book is regularly $34.99 plus shipping. The deal is $14 and the only additional cost is $8.99 for shipping. I encourage you to sign up if you haven’t already. Associate the album with the digital files: The size of the photo book is great for a coffee table to share with guests or a bookshelf to have on hand for reminiscing. But then I thought about what I would do when Bridget’s class is hosting a “Guess the classmate by their baby picture” game. How would I get a physical copy of a picture without cutting it out of the book or “digging” through folders of pictures on a computer we may no longer have? (Yes, these are the type of questions that go through my mind.) So, I transferred all of the digital files that were used to create the photo book to a flash drive. Again, because I named the folders very specifically and only kept the pictures worth putting in the photo book, this was quite simple. I then put a small label sticker in the back of the photo book with a number and put the same numbered label on the flash drive to associate one with the other. Secure the pictures: Finally, I store the flash drives in a fire safe box for safe keeping. – Bridget and I visited Brian at work for lunch. It was the first time I had been to Brian’s office and it was neat to see his workspace and meet his co-workers. Seeing Brian proudly show off Bridget never gets old. 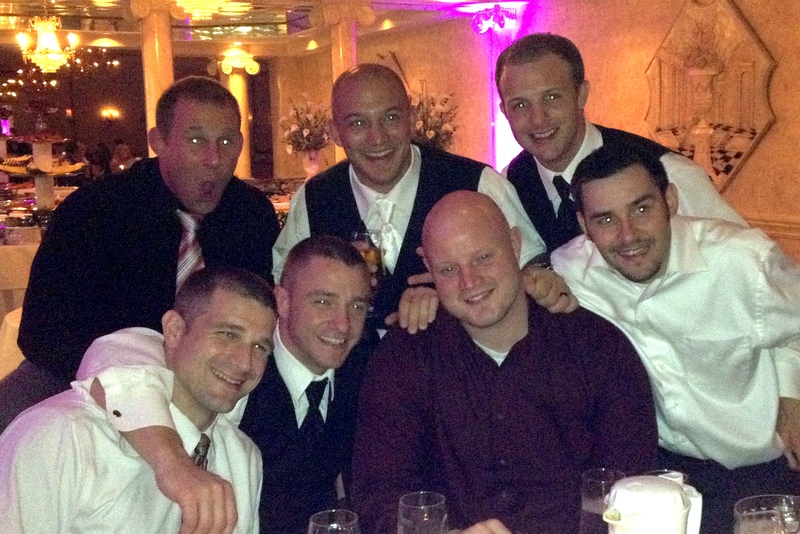 – Brian’s former housemate from college, Randy, got married this past Friday. Thanks to Grams, Brian and I enjoyed a date night. 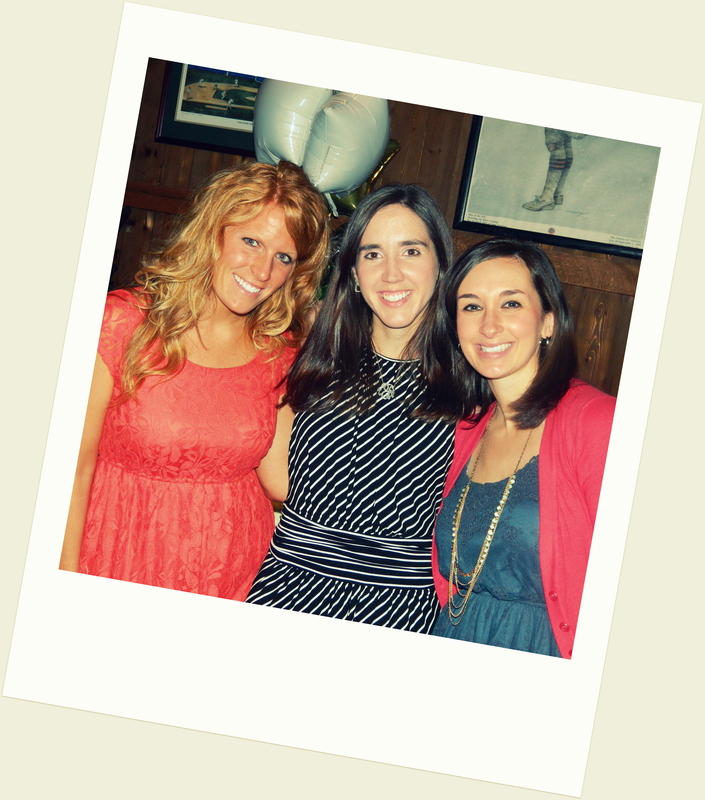 It was so much fun catching up with Brian’s college friends and their significant others. There is never a dull moment when those guys get together. And, Bridget’s night with Grams was much more successful than the first. I’ve learned a lot these last few months, and one lesson is to celebrate the little victories! – My in-laws live about three hours west of Cleveland so it’s been difficult to visit as often as we’d like since Bridget was born. We finally made it back this weekend and had a wonderful time visiting with Brian’s parents and his oldest sister, Amy, and her family. My niece, Madison, and nephew, Mason, are so cute with Bridget. Having cousins of my own with whom I share so many fond memories, I am grateful that she will have cousins to go through life with as well. In a bowl, cut the butter into the flour until crumbly. Stir in 1/2 cup of pecans. Press into an ungreased 13 x 9 x 2 pan. Bake at 350 degrees for 20 minutes or until lightly browned. Cool. In a mixing bowl, beat cream cheese and sugar until fluffy. Fold in one cup of whipped topping; spread over crust. Combine milk and pudding mix until smooth; pour over cream cheese layer. refrigerate for 15-20 minutes or until set. Top with remaining whipped topping and pecans. refrigerate for 1-2 hours. – I snapped this photo tonight and got a good laugh from it. For anyone on Facebook or Pinterest, it seems like there should be some funny quote attached to it but I’m not creative enough to think of one. If you can, feel free to share it in the comments section below. Above all, Brian and I want to raise a kind, loving, and respectful daughter. We don’t care if she is the best-looking, smartest, or most athletic. And God willing, we will be by her side, cheering her on in this journey of life, and trying to teach by example. Until then, I’ve created a list of 50 things I want to tell Bridget; inspired by a fellow blogger’s list for her own daughter. You are our greatest blessing. Whenever you need a good laugh, watch The Golden Girls. It’s timeless humor. Print your photos. In this digital age, you will want old pictures to look back on. There’s nothing a warm bubble bath can’t help. When your Dad I go away for a weekend without you, be glad, as our love is the foundation of this family. You’ll have more fun getting spoiled by your Grandparents anyway. Always give your seat to your elders. Never forget where you came from. You will always have a home with us. When you are a guest at a party, offer to bring something and always help clean up. Call your Grandparents just to say hello. You have made me appreciate my Mom more than I already do. Thank you. You are incredibly lucky to have your Dad. He loves you in a way no one else ever can. The Golden Rule will carry you through your entire life: Treat others as you want to be treated. Address your aunts and uncles as “Aunt” and “Uncle.” It’s a small joy in life that you’ll come to appreciate. Your Dad and I are, and always will be, your biggest fans. Always have a black dress in your closet. Call your friends on their birthday. A text or Facebook post just isn’t the same. Your husband should think you’re more beautiful in sweatpants and no makeup. Send a hand-written thank you card when someone does something nice for you. Above all, I am your Mom, but you will always have a friend in me. A Little Debbie Swiss Cake Roll is better than a real Ho-Ho. Go camping; the real camping, with no electricity or running water. Embrace your natural beauty, pale Irish skin and all. Don’t be afraid to be the first to apologize. Schedule in a lazy weekend every now and then. Look forward to the next phase of your life but enjoy the one you’re in. Ask me for your Grandma’s macaroni salad and sugar cookie recipes. You can call me any time, day or night, for any reason. Appreciate that people and families come in all colors and sizes. The quality of your friendships is far more important than quantity. Listen to Cat Stevens’ music. Your Dad and Grandpa will be proud. Cherish the relationship with your cousins. Don’t wear sunscreen less than SPF 30. I will never forget the way you made me feel when I first held you in my arms. The bookcase in your room has been in my family for four generations. I hope you can pass it on to your children. Visit the Berg. Afterall, that’s where this all started. Your Dad and I hope to one day give you a brother or sister. If you are unfortunate enough to inherit my vocal skills, you probably don’t have a future in the choir or music business. Sing anyway. Make your conversations two-way by being a good listener. I hope you keep your Dad’s lovely blue eyes. Put your phone and computer down enough to enjoy real life. Always be your beautiful self, whoever that is. I will enjoy teaching you about life, and also learning about it from you. Another week is here and gone. 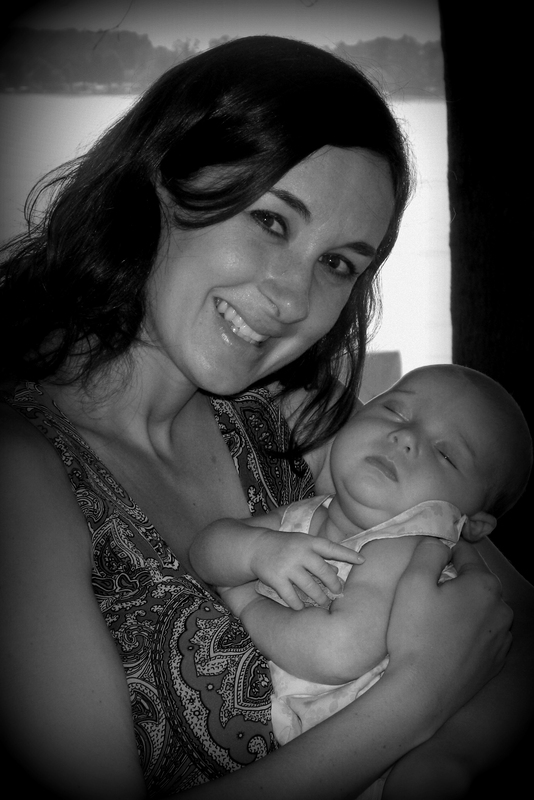 Time is flying by and I’m noticing it now, more than ever, as my maternity leave winds down. Only two more weeks at home with my Bridget, which is difficult to grasp, but I’m trying to focus on the good stuff and there was plenty of it last week. – One of my best friends, Kim, and her husband, Rick, welcomed their first child on Saturday, August 4; a baby boy, Maksim William. Kim and I were pregnant together for most of the nine months and it was fun to share our excitement and nerves; and now the experience of motherhood. I had the pleasure of meeting baby Maksim yesterday and he is healthy and beautiful. – Bridget and I spent a morning with Miss Denise, the woman who will be caring for Bridget when I go back to work. While it is sad for me to think about not spending my days with Bridget, it is comforting to know that she’ll be in good hands. – Bridget had her two month checkup and is doing well. 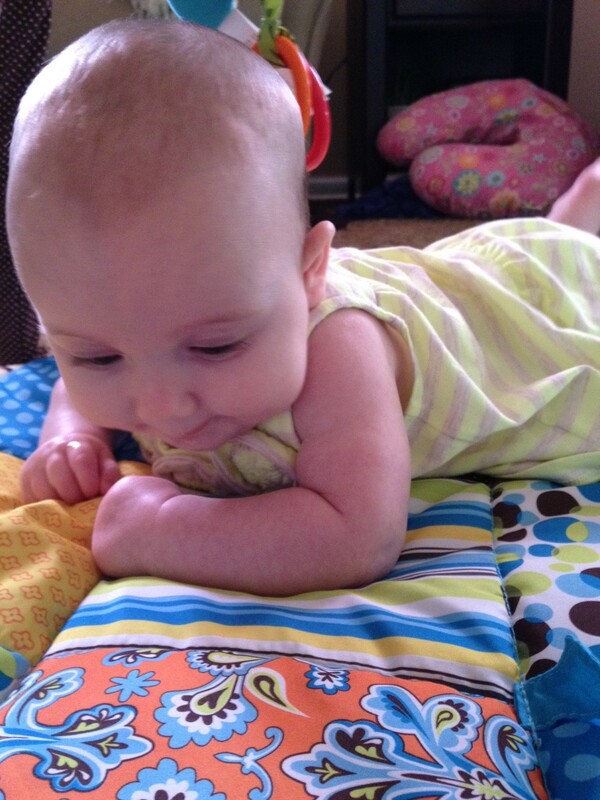 She’s in the 79th percentile for weight and 74th for height. I see a volleyball player in our future! – Longtime friend of mine, Jenn, was visiting from Indianapolis and we were able to spend some quality time together. I am so proud to call her my friend. Since we met 17 years ago, Jenn always said she wanted to be a doctor when she grew up. Well, we’re grown up and she is now in her last year of residency in Pediatrics. It’s not often people become what they say they will at 11 years old. Go, Dr. Jenn! My immediate thought was, “Married? Check. Happy? Absolutely. Rich? Well… hey, two out of three isn’t bad.” Then I thought more about it. At 17, I probably meant rich in the financial sense, but now I appreciate that there is a far more important definition of rich that I’ve accomplished. I am surrounded by people I love and people who love me and at the end of everyday, that’s the only kind of rich that really matters (although I wouldn’t mind winning the lottery, too!). So, I’ll consider myself three for three. Well played, 17-year-old, Shannon. Well played.